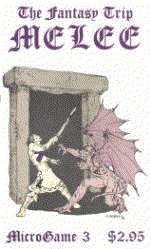 Tournament Melee is a set of rules for holding a Melee competition.The basic rules are taken from The Fantasy Trip: Melee Man-to-Man Combat with Archaic Weapons ,a MicroGame, first released by the company Metagaming in the 1977 and several editions thereafter.Initially the game was released in a thick clear plastic bag and included a 24 page rulebook, a heavy paper stock hex map, and a sheet ofcardboard counters.The Melee rules are short and concise.A character has a strength (ST), dexterity (DX), and movement (MA).A character is given weapons and armor, and they fight with their enemies on a small hex board.A single combat game requires about 5 minutes of playing time.Characters fight until one is dead or unconscious, and the other is declared the victor. Tournament Melee expands the rules of Melee intoa single-elimination tournament.Rules are provided for randomly assigning characters and fighting arenas. In general, all fighting is governed by the MicroGame rules Melee .Specifically, I am enforcing the rules from the Fifth Edition, copyright 1981.No optional rules are included from Wizard , In the Labyrinth or GURPS although a Wizard tournament likely will be added later. Each tournament player shall be assigned multiple characters.I anticipate 5 or 6 players, and I am trying to get 16 or so fighters into the tournament,so each player will likely be assigned 3 characters.With multiple fighters, a player will be less likely to be affected by a chance deathof a good character. The tournament is a single elimination tournament.Each fight is a one-on-one battle between two single opponents.Opponents are assigned randomly in the playoff system. Victors that survive move up the tournament ladder to fight the next battle.Victors are nursed to health to begin the next battle with no damage. Losers are either dead or unconscious.Dead losers are removed from play. Unconscious losers are at the mercy of the crowd.The crowd vote is simulated by a fair coin toss. "Finish him!" - the crowd votes that the victor kill his unconscious foe. "Spare him." - the crowd votes that the loser be spared. Unconscious losers are fixed up and nursed to health for a loser melee.The Loser Melee consists of all unconscious losers who were spared by the crowd.The sole survivor of this battle wins their freedom. The sole survivor of Tournament Melee is granted their freedom and 100 gold pieces. Each character shall be generated randomly using a six-sided die (D6). All characters are beginning characters whose ST and DX add up to 24. A player has the option of not randomly rolling their character in which case their character's ST shall be 9. Otherwise, a character's strength is randomly roll via the formula ST = 9 + 1D6.Therefore, using the D6 roll, the range of character ST is 10-15. All weapons and armor in Melee are freely available. Dress your fighter as you see fit. All fighters are human. No Elves, Dwarves, or other races are allowed. Once your character is complete and written up on the provided 3x5" index card, give your card to the commissioner so that he may be assigned in the tournament playoff. At the beginning of a fight, a random arena shall be chosen using a D6. Clear - the standard Melee arena is used. Trees - a standard Melee arena with trees is used. Rivers - a standard Melee arena with rivers is used. Scrubs - a standard Melee arena with bushes and scrub vegetation is used. Rocks - a standard Melee arena with rocks and pits is used. Hills - a standard Melee arena with hills and a pit is used. The six types of board are shown here. Print and use in your Melee tournament. Clear Hex-No change from the basic rules.Normal line-of-site.Normal movement.Normal hex for missile fire or thrown weapons.Normal combat. Tree Hex-Blocks line-of-site.Blocks movement.Blocks missile fire and thrown weapons.Blocks combat. River Hex-Normal line-of-site.Entering the hex costs 2 MP.Exiting the hex costs 4 MP.Characters may leap over the hex at normal cost (1 MP) if they are moving full speed (no dodge or crawl).Normal hex for receiving missile fire or thrown weapons.Affects adjDX by 2 for normal/pole weapons (attacker/defender in river receives detriment). Scrub Bushes/Vegetation Hex-Modified line-of-site.Acts as a "fallen body" for kneeling/prone cover in adjacent hexes.Entering the hex costs 2 MP.Exiting the hex costs 4 MP.Characters may leap over the hex at normal cost (1 MP) if they are moving full speed (no dodge or crawl)Normal hex for receiving missile fire or thrown weapons.Affects adjDX by 2 for normal/pole weapons (attacker/defender in scrub receives detriment). Rocks/Stone Hex-Normal line-of-site.Entering the hex costs 2 MP.No other effects on combat. Pit Hex-Normal line-of-site.Entering the pit kills the character.Force your opponents to retreat into the bottomless pit for instant victory. Hill Hex-Modified line-of-site.Unmarked hexes are level 1.Units can see/shoot up or down a line of hills (e.g. 123, 111223, 12333, 322222221) Units cannot see/shot up and down a line of hills (e.g. 121, 12332, 3212, 1232)Hills cost 1 extra MP to move up. For example a clear 2 to 3 move costs 2 MP.Hills do not add MP when moving down.Attacking down hill adds 1 to DX (not missile or thrown weapons).Attacking up hill subtracts 1 from DX (not missile or thrown weapons). Fighters are awarded experience points as per the "Combat to the Death" rules.That is to say, each kills receives 50 EP, and 100 EP are required tomove up a ST or DX point. There is no need for sportsmanship, this is life and death. There is no need for a post match handshake. All disputes shall be resolved by the sword. Barring that, the commissioner has the final say. December 29th, 2000 - bloody battle of 16 fighters! Last modified: Thursday, 09-Jun-2011 12:35:54 MST.